There was a bunch of over ripe bananas in the store at a bargain price. “Banana bread!”, I thought as I picked it up. 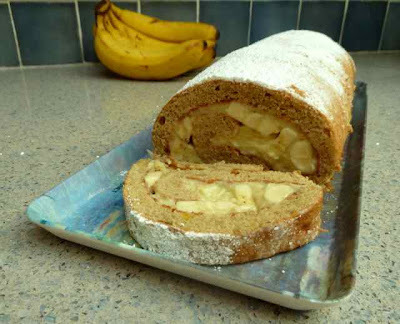 Lately I have been into making jelly roll type cakes, so I decided to try a banana cake roll. This recipe only required one over ripe banana, so I actually did make banana bread cupcakes as well and froze them. The cake is so good. Moist and with a very strong banana flavor. With the custard filling it was almost like banana cream pie cake. I took the cake recipe from my Jelly Roll recipe and added a banana, omitted the water and used all vanilla extract (no almond). It rose well and the sponge cake was springy. I used the custard filling from my Banana Cream Pie recipe. Slices of just ripe bananas went perfectly with the custard filling. If I had heavy whipping cream I would have whipped it. I’m sure it would have worked well to cover the cake roll with the whipped cream or to just serve each slice with a dollop on top. Preheat oven to 375 degrees. Prepare a Jelly Roll pan (10x15x1-inch) by lining it with aluminum foil and greasing the foil well with butter or non-hydrogenated margarine. 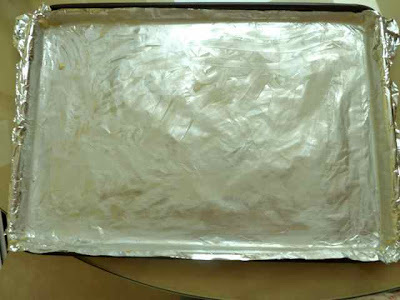 Jelly Roll pan lined with aluminum foil and greased. 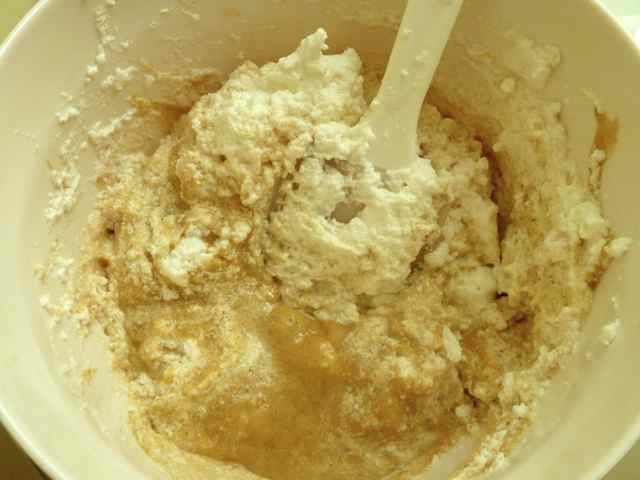 In a small bowl add all the flours, sea salt, baking powder, cinnamon and xanthan gum. Mix well and set aside. Whip the whites until stiff peaks form and set aside. In a large bowl mash the banana well, add the egg yolks, sugar and vanilla extract and mix well. Add the flour mixture to the banana mixture and blend together well. Fold the egg whites into the banana egg yolk batter. Folding whipped egg whites into the batter. 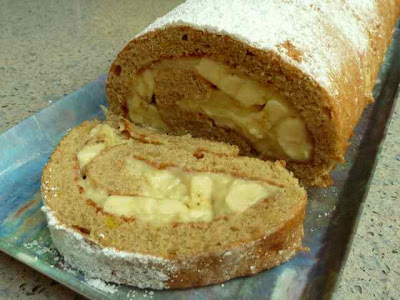 Spread the batter evenly in the prepared Jelly Roll pan. Raw batter spread evenly in prepared pan. Bake about 10-12 minutes or until the cake is golden and it springs back when pressed lightly with a finger. Be careful not to over bake or the cake will be dry. While the cake is baking prepare a smooth dishtowel by spreading it out on the counter and dusting it well with confectioner’s sugar. When the cake is done, remove it from the oven and turn it over onto the dishtowel dusted with powdered sugar. Peel off the aluminum foil. the dishtowel dusted with confectioner's sugar. While still hot roll the cake up in the dishtowel. Rolling up the cake when hot keeps the cake flexible and it will not break when unrolling and re-rolling it to fill the cake. Rolling the hot cake up in a dishtowel. Set the cake (still rolled up in the dishtowel), seam side down, on a rack to cool completely. 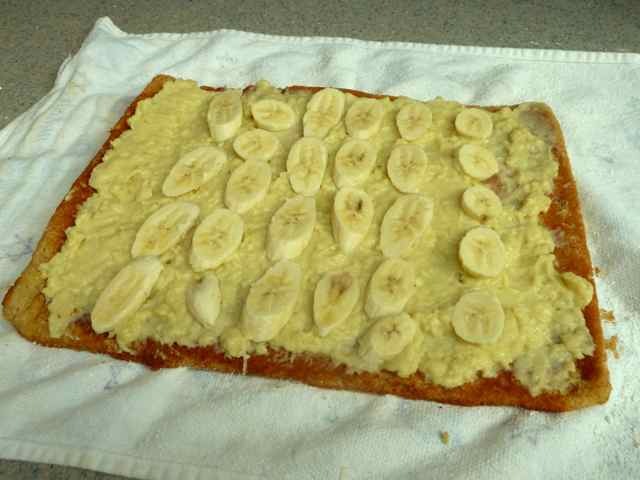 Cut the just ripe bananas into 1/2-inch thick slices. I usually cut the banana at an angle. Unroll the completely cooled cake. Spread the custard filling over the cake. I put a little more custard at the center edge and less at the outer edge. This makes the roll easier to re-roll and it looks fuller. Spreading the unrolled (cooled) cake with custard filling. Put slices of banana evenly over the custard filling. Sliced bananas placed on the filling. Carefully re-roll the cake, make sure to roll it tightly enough so that there are no spaces or gaps. Slice and serve. If you like, you can serve each slice with a dollop of whipped cream and fresh berries. GLUTEN FREE BANANA ROLL CAKE glutenfreebakingbear.com Ingredients 4 Eggs, separated 3/4 cups Sugar 1 Banana - very ripe or over ripe on the mushy side (if the bananas are not very ripe you can bake them with their skins on for 20 minutes per side in the oven at 350 degrees to make them more flavorful) 1 or 2 Bananas - just ripe (not mushy or brown) 1 tsp. Vanilla Extract 1/2 cup Sorghum Flour 6 Tbs. Tapioca Flour 2 Tbs. Chickpea Flour 1/2 tsp. Xanthan Gum 1/4 tsp. Sea Salt 1 1/2 tsp. Baking Powder 1/2 tsp. 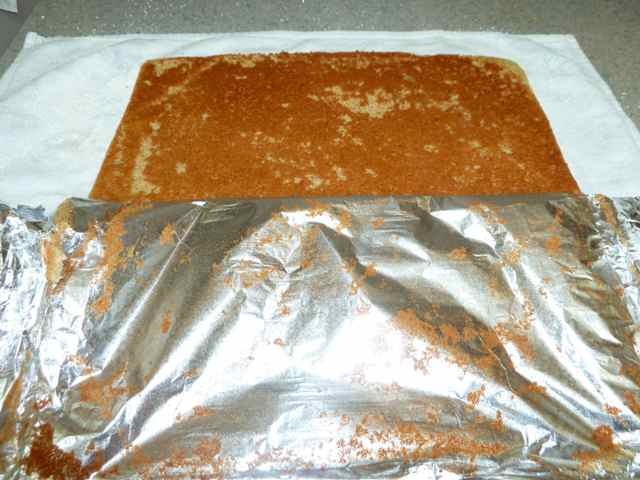 Cinnamon 1-3 Tbs. Confectioner’s Sugar for dusting Directions Preheat oven to 375 degrees. Prepare a Jelly Roll pan (10x15x1-inch) by lining it with aluminum foil and greasing the foil well with butter or non-hydrogenated margarine. In a small bowl add all the flours, sea salt, baking powder, cinnamon and xanthan gum. Mix well and set aside. Separate the eggs. Whip the whites until stiff peaks form and set aside. In a large bowl mash the banana well, add the egg yolks, sugar and vanilla extract and mix well. Add the flour mixture to the banana mixture and blend together well. Fold the egg whites into the banana egg yolk batter. 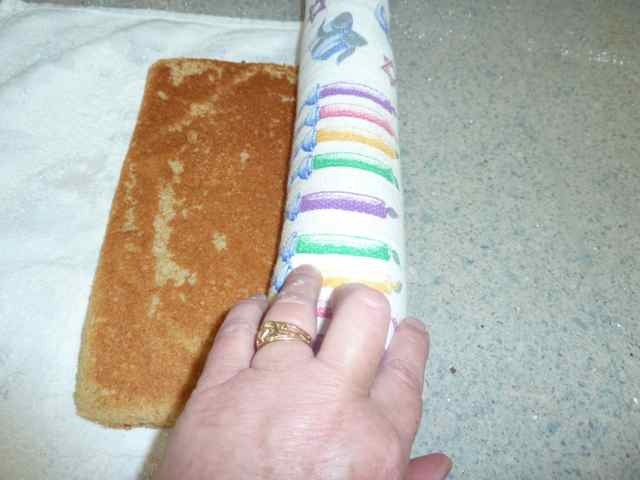 Spread the batter evenly in the prepared Jelly Roll pan. 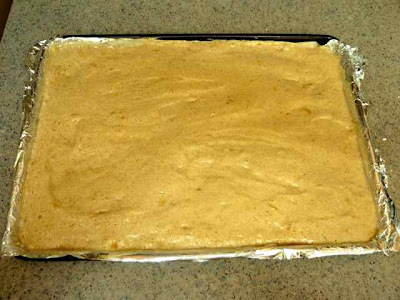 Bake about 10-12 minutes or until the cake is golden and it springs back when pressed lightly with a finger. Be careful not to over bake or the cake will be dry. While the cake is baking prepare a smooth dishtowel by spreading it out on the counter and dusting it well with confectioner’s sugar. 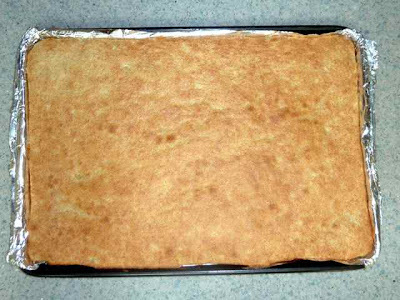 When the cake is done, remove it from the oven and turn it over onto the dishtowel dusted with powdered sugar. Peel off the aluminum foil. While still hot roll the cake up in the dishtowel. Set the cake (still rolled up in the dishtowel), seam side down, on a rack to cool completely. Prepare the custard filling. 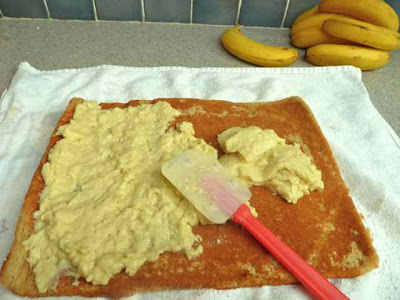 Cut the just ripe bananas into 1/2-inch thick slices. I usually cut the banana at an angle. ASSEMBLING THE CAKE Unroll the completely cooled cake. Spread the custard filling over the cake. I put a little more custard at the center edge and less at the outer edge. This makes the roll easier to re-roll and it looks fuller. 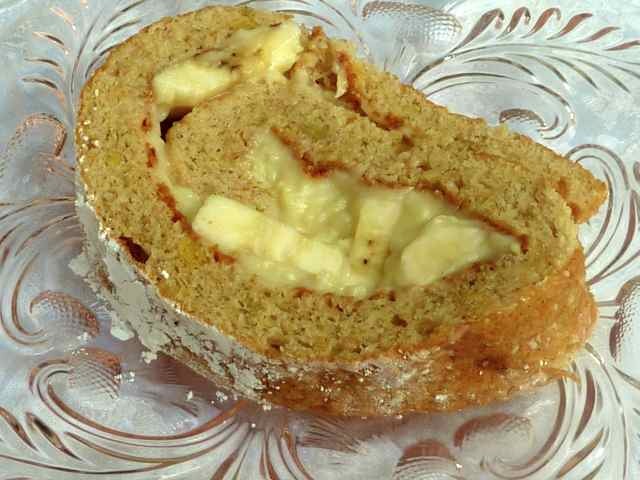 Put slices of banana evenly over the custard filling. Carefully re-roll the cake, make sure to roll it tightly enough so that there are no spaces or gaps. Move the cake to a platter and dust with confectioner’s sugar. (If you want to cover the cake with whipped cream, do not dust with the sugar, spread the whipped cream over the cake and smooth it out with a rubber spatula.) Slice and serve. If you like, you can serve each slice with a dollop of whipped cream and fresh berries.